In the last two years, recruitment numbers for fraternities, sororities and societies at Kenyon have dipped. While this year saw an increase of pledges from the previous year, Greek organizations have yet to reach their pre-2017 recruitment levels. Recruitment numbers for spring of 2016 and 2017 were in the high 170s, but they have dropped dramatically since. In 2018, Greek organizations received only 146 pledges; the number has risen slightly this year, at 160 recruits thus far. Assistant Director of Student Engagement Ashley Rastetter, who oversees Greek Council and the eleven Greek organizations on campus, speculated that the dropping numbers are related to the nationwide influx of fraternity-related deaths over the past two years. “Our national landscape of fraternity and sorority life outside of Kenyon is changing,” Rastetter said. Rastetter mentioned, among others, the death of Timothy Piazza at Pennsylvania State in February 2017. Piazza, a member of the Beta Theta Pi fraternity, died after a night of hazing incidents involving excessive drinking. “Those were pretty big household-name hazing cases,” she said. While some Greek organizations have struggled to recruit, others have flourished: Both Alpha Delta Phi (ADs) and Beta Theta Pi (Betas) saw dramatic increases in pledge numbers. The ADs increased their recruitment numbers from 12 in 2018 to 17 this year. Beta recruitments more than tripled with 25 recruits this year, up from eight the year before. This year’s figures also represent the largest recruitment range of any two fraternities or sororities. Compared to the Beta’s record number of recruits, Delta Phi (D-Phis) secured merely three new pledges. Only marginally better off was Phi Kappa Sigma (Phi-Kaps), with four pledges total. When asked whether these disparities could be attributed to the suspension of Delta Kappa Epsilon (DKE) last year, Rastetter said she didn’t see that in the data. 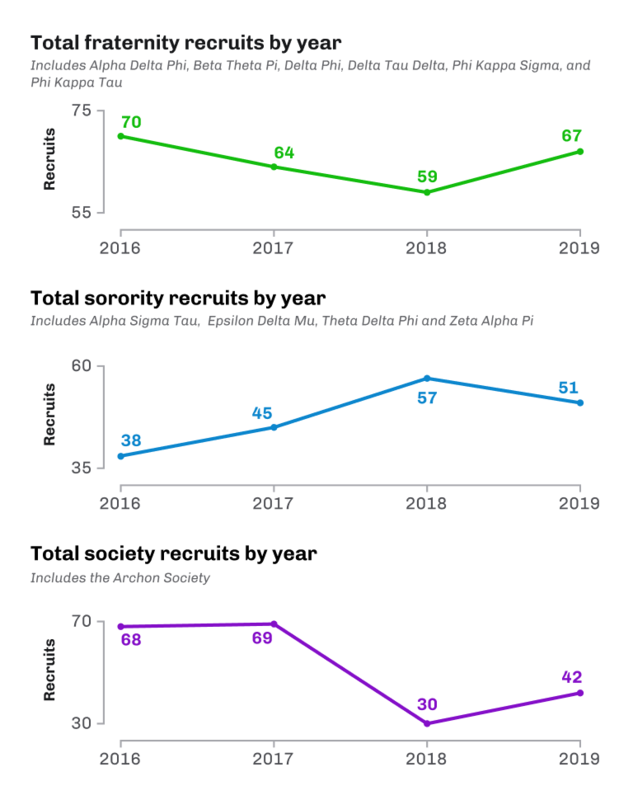 Since 2016, there has been an increase in students pledging sororities: In 2016, sororities received 38 recruits, accounting for 21 percent of recruitment that year. This number has increased to 45 in 2017, 57 in 2018 and was 51 this year. Rastetter said that sororities in general are more selective, which may account for why fewer students wanting to join them receive a bid. In general, Rastetter said she wishes to create a more positive environment around Greek life at Kenyon. She said that the media often downplays the role of service and philanthropy, while highlighting the more infamous aspects of Greek organizations. “I think that there are many organizations that really pride themselves in providing an experience that’s developing a student holistically outside of their academic experience,” she said. Why doesn't this article quote, or indicate any reporting outreach to, Greek organizations or anyone other than an administrator? Also--these numbers do not indicate a significant decrease in pledging, nor does it compare Kenyon to peer regional schools or colleges/universities overall. Why even print this?